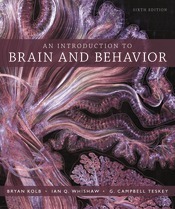 From authors Bryan Kolb, Ian Whishaw, and G. Campbell Teskey, An Introduction to Brain and Behavior offers a unique inquiry-based approach to behavioral neuroscience with each chapter focusing on a central question (i.e., "How Does the Nervous System Function?"). The authors emphasize a distinctive clinical perspective, with examples that show students what happens when common neuronal processes malfunction. The new edition continues the Brain and Behavior tradition of incorporating the latest research throughout the book. Revisions include new material discussing current research on genetic mosaics and modification, including transgenic techniques and optogenetic techniques, neurotransmitters, hormones, brain development in adolescence, psychobiotics, color perception, and biorhythms, as well as updates to the discussion of specific disorders to reflect the current state of understanding, including Parkinson’s disease, Alzheimer’s disease, depression and drug dependency, sleep disorders, schizophrenia, glaucoma, and abnormal development related to prenatal experience.